During October 2013, we took a three week car tour around central Europe. Traveling with family was great fun. We enjoyed fine weather and excellent food, and we met friendly people. I drew one drawing a day, usually. One day I drew three. Armchair travelers who might wish to learn more about any of our stops along the way can follow the trip at our travel blog. Our first proper meal after arriving in Germany was in this restaurant in Bingen, right next to the Rhine River (Rhein in German). The cable cars go up to a large monument commemorating the unification of German states in 1871, which then included most if not all of Poland. The makeup of Germany, and indeed of much of Europe, has moved around a lot in the past few centuries. We’d now like to think that things have stabilized and that the resulting countries will finally enjoy a time of tranquility. It was certainly our impression that life was pretty normal everywhere. Note the extremely long barge. It was about twice as long as I could fit into a vertical format. River traffic was very heavy in both directions, here and everywhere else. River cruise boats were plentiful as well. 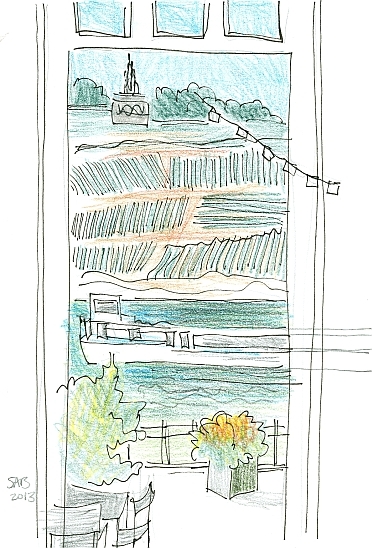 The areas of parallel lines indicate the steep rows of vines, growing the grapes that become Riesling white wine. We had some plans to go to Koblenz, but we made a quick decision to travel up the Mosel River to the smaller city of Cochem instead. 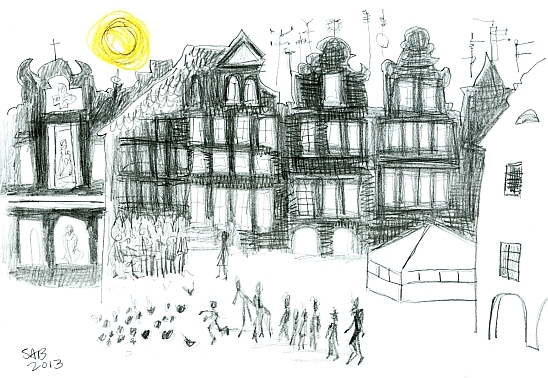 Sure, it was crowded in the square when I drew this. But there is a level of energy in crowds that can be enjoyable. I just stand there with my small drawing pad and let the people swarm around me. Then it all becomes part of the memory. The pink building is the town hall, the Rathaus. We got very touristy by taking a little tram ride around town with narration in a headset. So we heard English and German at the very same time. That required great feats of concentration. On our way from our first stay in Ney near the Rhine to Goslar in the Harz Mountains, we encountered a massive traffic jam, Stau in German. The kind where after a while you get out of the car to stretch, or even walk off into the woods for a few minutes. Here is Stephen making a new friend, Felix. His family owns a vineyard, and he was on his way to conduct a wine tasting. So Stephen had a lot of questions about German wines. We hope Felix had allowed plenty of extra time in his schedule so that the tasting could go on as scheduled after the Stau finally cleared up. 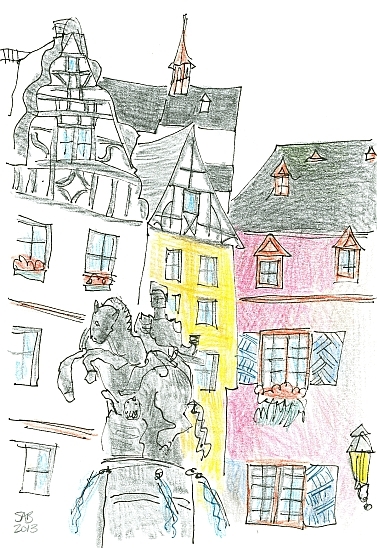 We finally did reach our destination city of Goslar. Most of the buildings here are completely covered in slate tiles. This eagle fountain is in the main market square. The wealth of the city came from an extremely rich silver mine nearby. The mining operations lasted a thousand years, basically from 1000 AD to 2000 AD. 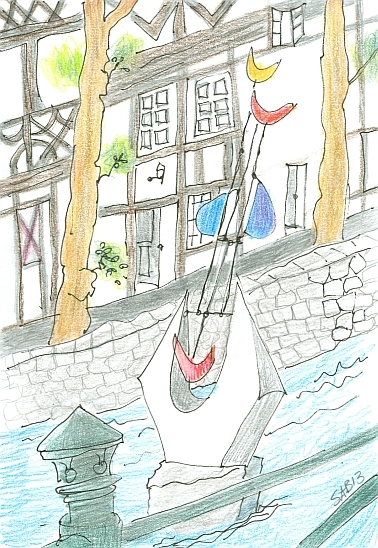 Just for fun, I drew this modern sculpture in Goslar, located in the middle of a mill stream that runs through the town. Could this be anything other than a face with two birds on the head? We enjoy eating in Ratskellers in Germany. 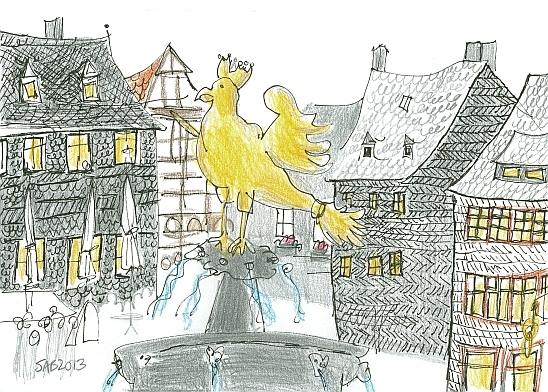 Ratskeller literally means the cellar of city hall, and a city’s Ratskeller is a source of civic pride. None has ever disappointed. And the architecture always looks just like this. Here we are in Helmstedt. Steve and Bruce are the ghostly transparent figures. In Berlin we went into the exhibit called the Story Of Berlin. We had been there in 2000, and it was well worth coming back to. It is quite an amazing place, built into many locations within the innards of a large city block (where we once lived in 1972), and arranged chronologically. World War II is on one of the lowest floors, and the literal descent into it from many flights above presents a real sense of foreboding. The exhibit is sometimes enlightening and uplifting, and many times terrifying. 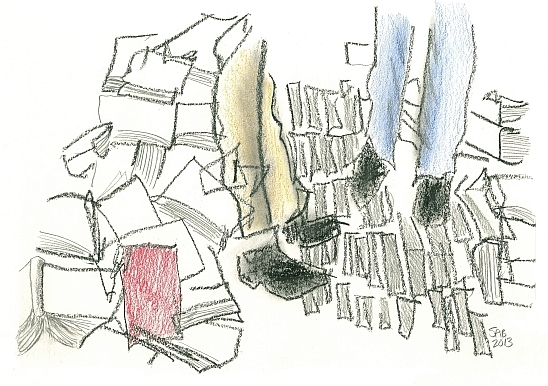 Here on the self guided tour, I stopped to draw the piles of forbidden books that were thrown onto the streets to be burned. By the Nazis of course. The floor is paved with actual book spines, rather than cobblestones. It is an awful feeling to walk on the books. I drew the books while a teacher on the right was lecturing to her class, one student’s feet on the left. There is a very minimalist commemoration of the book burning near the Humboldt University in the former East Berlin. It consists of a set of empty bookshelves. 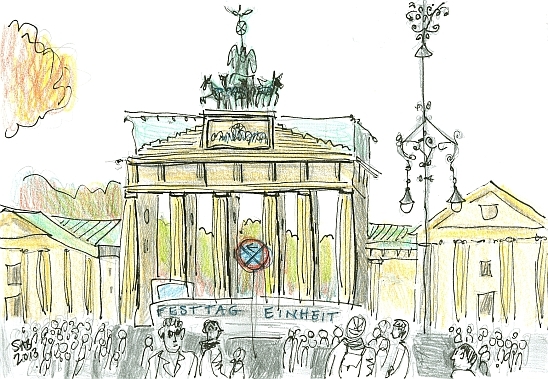 Here is the view of the Brandenburg Gate, the symbol of Berlin. We are facing west from the Unter Den Linden, the grand avenue of the former East Berlin and now of all Berlin. Unter den Linden is currently all torn up for subway construction, due for completion in 2015. The words mean Unification Festival Day. The official commemoration of the unification of Germany after the Fall of the Wall takes place on October 3rd, and Berlin’s celebrations extended onward for a few more days. Why not? But still, we missed it by a day or so, and they were just cleaning up when we got there. Many believe that November 9th should be the day to be celebrated, as that was the day in 1989 when the people breached the Berlin Wall. But that date unfortunately coincides with a dark day in the runup to World War II and the persecution of the Jews, so it was not deemed officially acceptable as a national day of celebration. But the people of Germany may just change that, at least de facto. We picked up our wonderful three hour walking tour (with an English guide who loves Berlin) from this point. We learned about the tour at the Starbucks right here near the Brandenburg Gate. I don’t know how long a woman was looking over my shoulder and watching me sketch. She surprised me when she commented that my drawing was schön or ‘nice’ as I didn’t even know she was inches away from me. From Berlin, we crossed over the border to Poland. 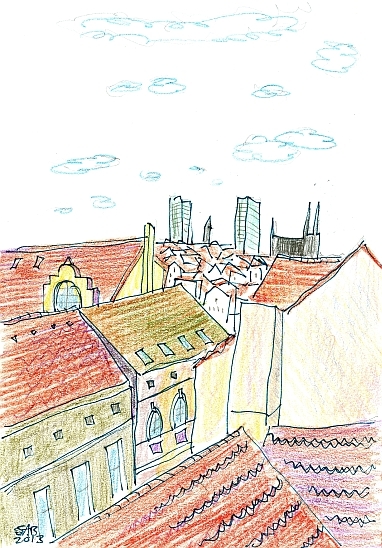 We spent two nights there in the attractive and lively city of Poznań, in an Airbnb apartment. Poznań’s population is twenty five percent university students. Our hostess gave us fine advice for an evening meal. After our dinner we found a liquor store and purchased mint schnapps and cherry schnapps. The bottles made a colorful still life on the embroidered tablecloth in our sitting room. 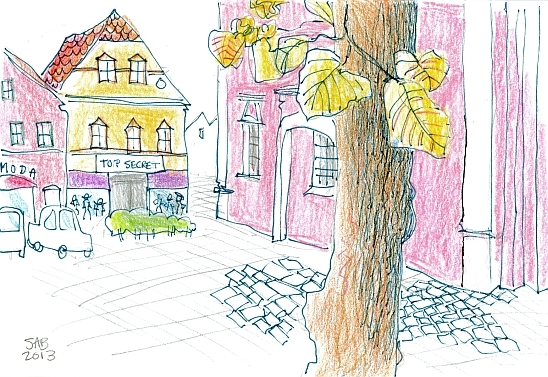 The buildings in main square in Poznan, the Stary Rynek, are all pastel pretty tints. The traditional old style homes were rebuilt after the destruction of the Second World War. But the sun was in my eyes and the ornate buildings were backlit. So I decided to draw them all in graphite pencil. This technique emphasizes the window placement and the roof lines. There’s a tour guide there in the square with her charges, and pigeon chasers too. And one clever little sparrow who was able to sneak in beneath the pigeons and make off with some of their loot. The little tent is there to extend outdoor restaurant season into the autumn chill. We ate a fabulous midday meal (a turkey curry) in a renovated brewery aside a very upscale mall. Not only did it taste great, but it was the daily special and very inexpensive. Including wine. Then we hiked to a bead shop for Aimée. My tail was dragging that day, as I had still not adjusted to the six hour time zone change. On our way to our next destination in Poland, Wroclaw, we stopped here in Rawicki. We just wanted some coffee, as well as a bathroom. We walked ALL over looking for a café, a restaurant, or some other sign of coffee, even asking directions and receiving an answer that would have sent us a long way away. And by this time we had learned the Polish word for coffee, kava. But there was none to be found. Nada, kava. We did finally find juice and some famous Polish jelly donuts. As well as this pink town hall in the center of the town square—where the cafés should have been. Rawicki is now known to us as the Town Without Coffee. But the town did provide a lace curtain shop for Aimée. We enjoyed our two days in Wroclaw, a city in the southwest part of Poland. We tried very hard to learn to pronounce the name of this old, yet modern and vibrant university city. Wroclaw = Frotswof. That was the best we could do without being able to roll the r.
I drew the two houses called Hansel and Gretel, in English. (I learned that the direct Polish translation is Johnny and Maggie. But we are talking about the same story.) They are called that by the locals only because they are smaller than the surrounding buildings and appear to be holding hands. That is the only reason. The two houses are the remaining buildings of those that once encircled the St. Elizabeth Church. An artist/activist named Eugeniusz Get-Stankiewicz lived the house on the right until his recent death. He painted the colorful and abstract color patches all over the sides of his house. Each color swatch brings attention to a small defect in the stucco....a lump or tiny crack. A very subtle sign of rebellion against the Communist regime. There were other subtle protests here in Wroclaw as well, like tiny little subversive gnome graffiti and sculptures. Poland was ruled by repressive regimes for hundreds of years. And then back to Germany again, this time to an old but very updated hunting lodge in the woods named the Churfürstliche Waldshänke in Moritzburg. (It’s such a mouthful that we never tried to say it.) We think this means the prince’s tavern in the woods. It is situated between Meissen and Dresden. 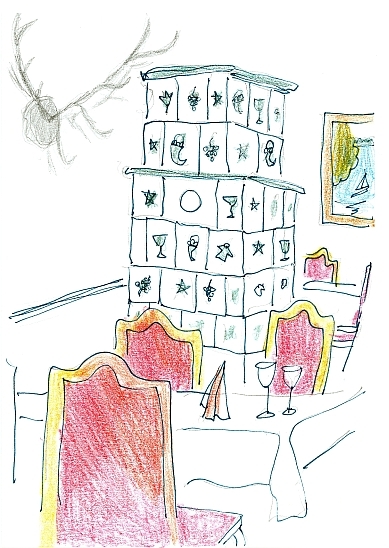 We happily sagged into the chairs here, near the tile fireplace, for a good meal. After a morning walk the next day to another pink building, a Schloss (castle), we spent a whole day in Meissen. Shopping, eating, climbing towers, and hoofing it up steep cobblestoned lanes. The usual stuff, except we then hiked over to the the Meissen Porcelain Factory. And spent several hours (and no money other than the admission charge) learning all about how they make such beautiful china. Their live clay demonstrators were excellent. Most of the specimens in their large museum were sculptures, not dinnerware. Many were originals from a few centuries ago, while others were recast in more recent times from the original, centuries old, molds. After the very long and enlightening stay in the Meissen Porcelain Factory, we made our way back to the main square. The dark and the rain made an Italian café look enticing. 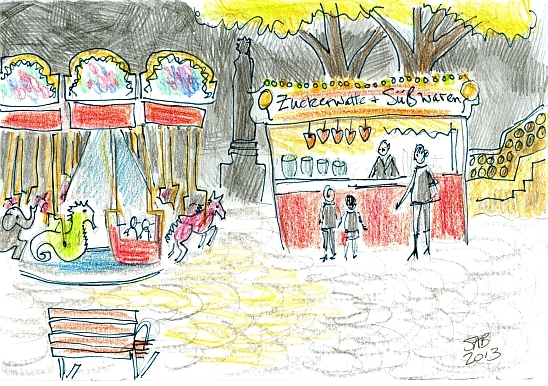 After my coffee and plum kuchen, I drew this tiny carousel and cookie stand which was right outside the cafe. The German words mean ‘sweet stuff’. 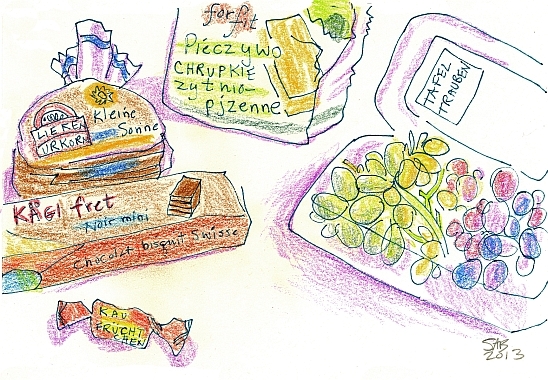 The owner of the sweet shop and the carousel came over to inspect my drawing, and to make sure I knew that his cookies were the real thing, the heart shaped lebkuchen. At least that is what I think he was saying to me. His explanations got louder when I told him I didn’t understand. So after a while I agreed to it all, with the easy ‘ja, ja’. The owner delayed pulling down the canvas wraps to his stalls when he saw me sketching. That was kind. My carousel horse is not well drawn as it appears to be making a break for it into the night. I saw three mini-carousels in Germany. The paintings around the top center were all scenes from Grimm’s fairy tales. This particular carousel had images from Little Red Riding Hood, or Rotkäppchen in German. And on to a new country for Bruce and me, the Czech Republic, and its capital, Prague. Here is the view from the rooftop of our hotel, the Hotel Julian. This is not a standard view towards anything famous. Those two highrises are very far away and not in the direction of the old town. The next day in Prague, we spent three and a half hours with a private guide hired by Aimée on the recommendation of a friend who had toured with her in the past. She was a wonderful guide, and we packed in so much more than if we had been on our own for all that time. We did go over the famed Charles Bridge in the afternoon, on our own, to take in the Alfons Mucha Museum. Mucha is the best known artist of the Art Nouveau movement in Paris. After the art museum, we felt we needed to put time in at the Museum of Communism. It was hard to find, but we persevered and located it next to a McDonald’s and inside a casino. It was rather harrowing but felt good to learn even more about the resiliency of the Czech people. And more details of the Velvet Revolution in 1989 when ten days of peaceful and massive street protests caused the Soviets to pull out of the country. 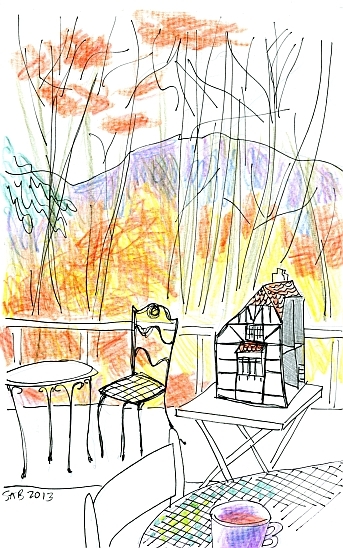 On the way back to our hotel, we stopped for hot wine, and a sketch. 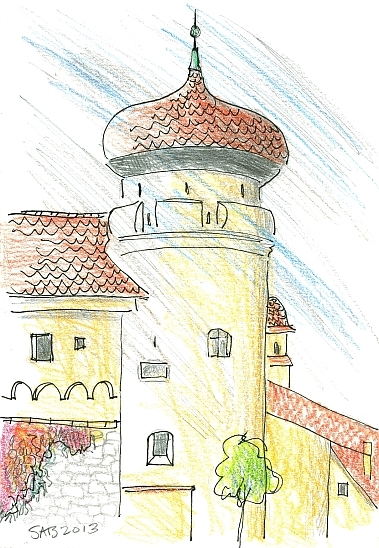 I drew this end tower of the Charles Bridge with my back to an ice cream sign as thousands of people swirled around me. I was like a happy rock in a stream. 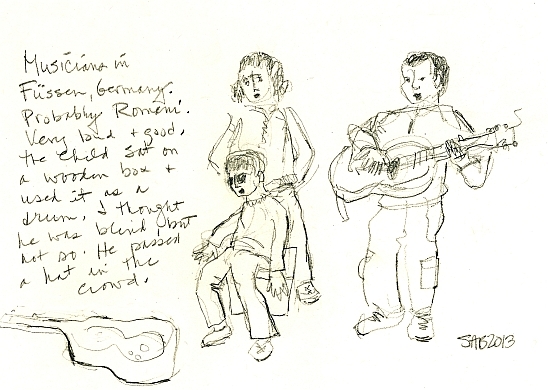 The next day, after too short a stay in Prague, we drove back into Germany, to Nuremberg. 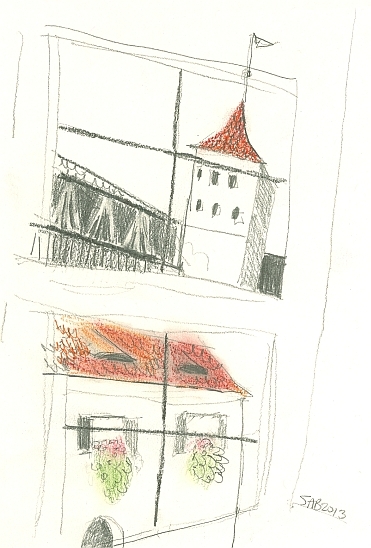 This tiny, very quick sketch is the view from the bedroom of Albrecht Dürer’s house. You see the town walls, and a gate and turret. And a house built against the town walls. Dürer’s fame as an engraver and painter from the late 1400s and early 1500s endures today. No pun intended. I LOVED walking through his house and studio. The many flower stalls on the Salt Square in Wroclaw remain open twenty four hours a day. 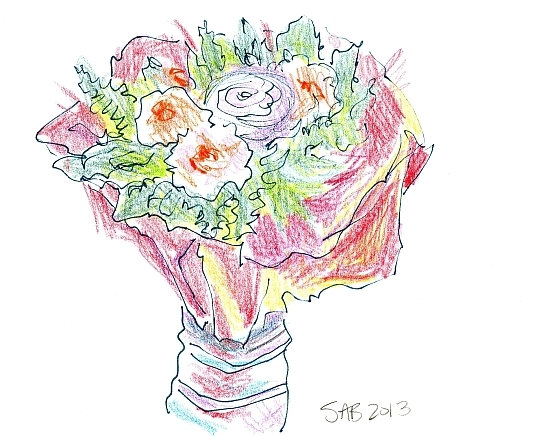 We bought this small arrangement of one rose and four carnations, greens, and dried grasses, wrapped tightly. It lasted well for twelve days. We carried it with us in the car, and into our hotel rooms at night. The impromptu vase was a cut down water bottle. Aimée said it was magical how it survived and traveled with us. The food items in our possession do multiply after a while. There are three, maybe four, languages here. No English though. (No, wait. It says ‘for fit’ in English.) We always stopped at grocery stores, so we could have ample snacking in our rooms. And they are amusing to study carefully, and draw joyfully. Füssen is a small city in Bavaria, right up against the Austrian border. Our time there was lovely... a warm, sunny day, with no crowds, lots to see, and a fine meal in a sidewalk cafe. 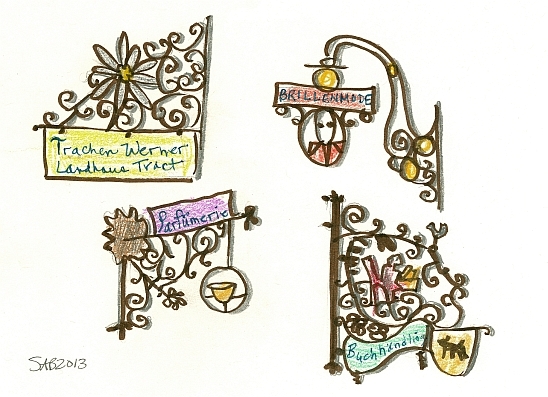 I drew these wrought iron traditional shop signs from my chair after my lunch. They are advertising the wares within the shops....folk clothes, fashionable eyeglasses, books, and perfumes. Wieskirche is a church in a field near Füssen. Which is a direct translation of the words. The ornate baroque interior is world famous. I went to an organ recital there once, 41 years ago. Unintentionally, due to underdeveloped language skills. Long story. 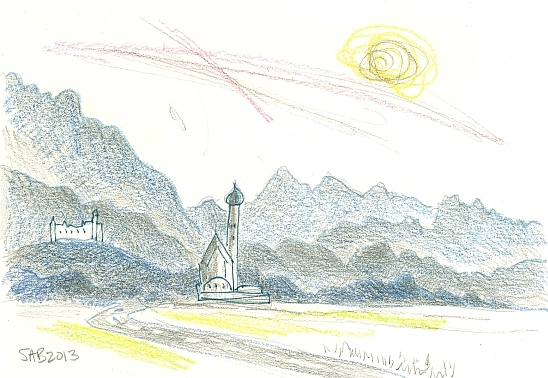 The castle to the left is Neuschwanstein. The day was hazy and the colors muted. The sun was very warm in Garmisch, Germany. 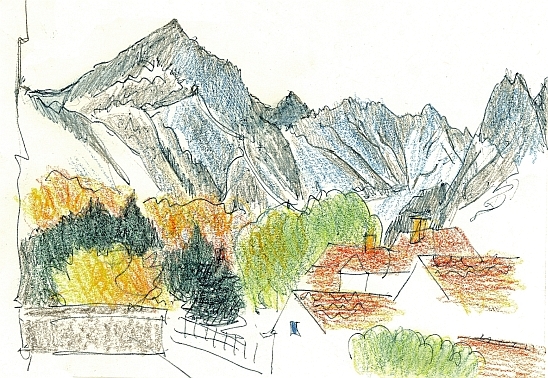 The high Alps may block some wind and weather, at least in October. The mountains are so pointed that they seem to have been made yesterday. 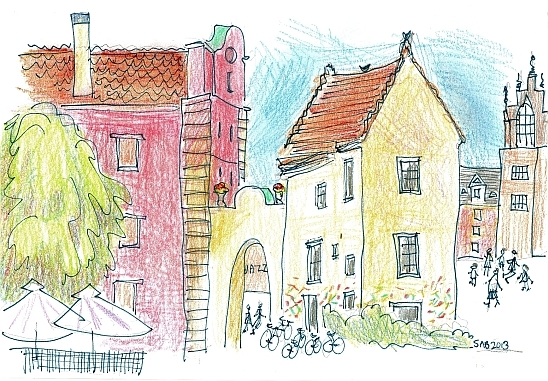 Our last day of our trip was in Nördlingen, Germany, on the famed Romantic Road. It was rainy and grey at times. We loved this walled city anyway. 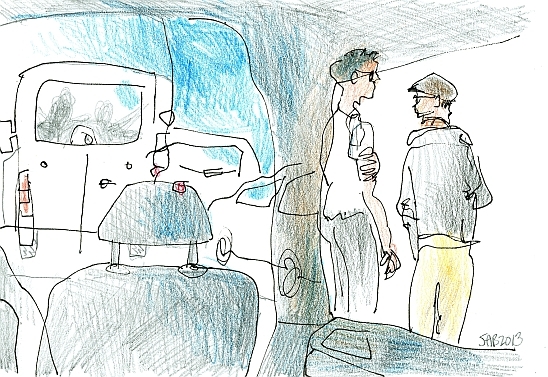 I drew the view from where we parked our car outside the walls. In the former moat. 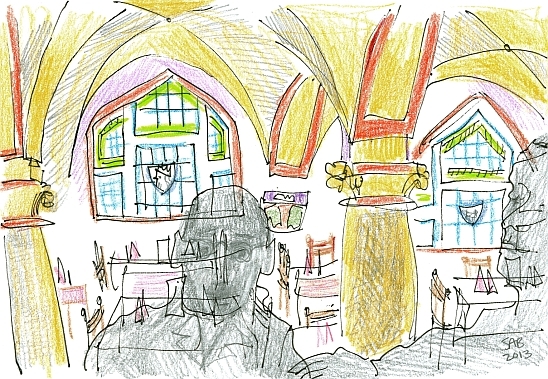 As we walked around the high ceilinged, fan-arched town church, something struck me. (Not literally) I had never seen the grey kind of stone that was used by the architects and builders. Soon we were to learn that this kind of stone was created by a meteor, hitting this area a mere 15 million years ago. It is unique in the world. It has diamonds in it. Tiny ones. And the town has a wonderful science museum all about the meteor event. US astronauts visited the museum before the Apollo launch to practice their excavation techniques. A moon rock is displayed there. And back home we come to New Hampshire, USA. So we didn’t miss all the autumn foliage display while we were gone. The beech trees are still all gold and bronze. 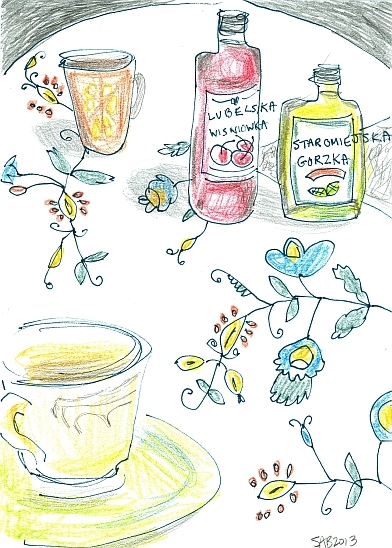 My cup of tea on the checked tablecloth was penciled in first. Then up to the grandchildren’s doll house, with its old world style architecture. The upper set of table and chair are out doors on the deck, beyond the glass wall. The purplish hill is not the Alps, but beautiful nonetheless.